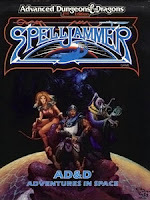 After doing entries about the Forgotten Realms and Marvel Super Heroes, I had every intention to talk about some of the other games and campaigns I’ve worked on, but put it aside until someone sent me an email asking about the secret history of Spelljammer. I’ve said some of these things elsewhere, but this is pulling all of them together. 1) The original concept of Spelljammer came out of a now-legendary designer pitch session at Augie’s in Lake Geneva, near the Horticultural Hall (Augie’s became Cactus Club, and is now Ryan Braun’s according to the Google Maps). Manager Jim Ward called the get-together to discuss the boxed sets for the next year. From the table conversation, the waitstaff thought we were location scouts from Hollywood (and that Jim’s assistant manager, Warren Spector, was Steve Spielberg). 2) One of the things that I came into the pitch session with was the idea that I wanted to push the envelope on what D&D fantasy was. Yeah, we had done FR and DL, but those had been written down as typical fantasy worlds. Vanilla fantasy. Default fantasy. Background static. Here was a chance to go out on more of a limb and push the envelope. So this was the chance to do D&D in space. I’m sorry – Innnnn Spaaaaaaace! 3) Here is the image I pitched. A knight standing on the deck of a ship in space. He doesn’t freeze. He doesn’t blow up. He doesn’t float away. Everything that follows comes out of that one image, which is captured (with more to it as well) on the final cover Jeff Easley did. All what people have called “Grubbian Physics” with its air envelopes and its gravity planes, comes from creating a universe where that image is true. 4) Despite pitching hard for the idea, I almost didn’t get the nod to do it. The other idea that came out of the meeting was a boxed set for the far side of Krynn, in the lands of Taladas. Zeb Cook said something along the lines of “Well, I’ve never worked on Dragonlance, so I guess I get AD&D in space.” Jim Ward, bless his heart, countered with, “Since you haven’t done any Dragonlance, Zeb, this would be a great place to start”. And that was how I ended up with Spelljammer and he ended up with Time of the Dragons. 5) For the boxed sets at that time, we had a format – two 96-page books, 4 big color maps, and a bunch of light cardboard sheets. Our task was to fill that space. Sometimes the format worked, sometimes it was less successful. For Spelljammer, we used them to create the ship stat cards and standups. So that worked out pretty well. 6) So, the name. Descended from the windjammers, the old ships. In the game we used it to describe the act of moving through space magically. And it was the class of ship that moved through space. And it was the proper name of the legendary Spelljammer, a supposed Flying Dutchman/White Whale. It was a noun, a proper noun, and a verb. If I could have made it an adverb I would have done that as well. 7) The trademark guys hated the name (“So you’re the one,” said one of our lawyers, after publication). This was a regular nightmare in the office – marketing would want a name that captured everything about the product, making it easier to sell. The trademark lawyers would want the name to mean absolutely nothing, so it would be easier to trademark in a variety of fields. Spelljammer was clearly in the former but not the latter. 8) Spelljammer was initially thought of as being AD&D in space (Sorry - Innnnn Sppaaaaace! ), but soon became obvious as a way to tie the existing campaigns together. One of the challenges of all the campaigns existing in the same reality, was that there are small differences like gods, for example, some of which overflow into other campaigns and others which do not. And things like the constellations of Krynn moving around . Crystal spheres, enclosing each solar system in its own container, were the answer to that. 9) The crystal spheres were inspired by the picture on the right, which was the cover of Daniel Boorstin’s The Discoverers. I thought it was a medieval woodcut, depicting the wise searcher of knowledge piercing the walls of reality to find the elegant clockwork beyond it. Actually, it’s not a medieval woodcut at all, but an from the late 1800s. Still, it is a cool picture. 10) The spheres allowed us to have whatever rules we wanted within the spheres themselves. Want to run a hard science version? It works that way in the sphere. Want the constellations to move around? There you go. Want a flat world resting on elephants, with iterative turtles below? Go for it. Krynn and Toril were presented as heliocentric universes, but Oerth ended up geocentric, primarily because I always felt that Oerth was the center of its universe, and here was the chance to prove it. 11) The crystal spheres also allowed us to have tactical drive and hyperdrive. This is a challenge in both games and fiction – you want one set of rules for moving ships around in-system, and another that allows much quicker movement between the stars. Star Trek has warp drive and impulse power. Rather than have two types of spell-powered space drives, we had two different types of space. 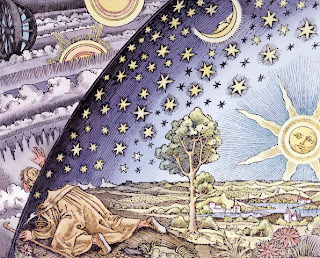 12) One thing we avoided was aether, which was an old-time theory of how the universe worked. It goes as follows - if light is a wave, then it has to travel through a medium, so there had to be a medium between the planets that did not slow down the planets but allowed light to propagate. Aether was conceived as a substance that had to exist to make the theory work. Mock it if you want, but nowadays we talk of dark matter, which has the same sort of odor wafting off it. We ALSO (in the real world) once had phlogiston, which came out of theories of how fire worked. The French theorized that fire was extremely fast oxidation. The English mocked the French and declared that items had an inherent “burning-ness”, called phlogiston, which was undiscovered by clearly made their theory work. So that’s where we got phlogiston in the game, and why it was so explosive. 13) The ships of Spelljammer were created by an interesting process. I would give broad art suggestions to Jim Holloway (“Give me a squid ship. How about a translucent butterfly? OK, have about a chambered nautilus?”) Jim would draw them up, we would select the ones we liked (mostly all of them) and Dave (Diesel) LaForce would do the deck plans, according our rules with the gravity planes. This accounts for a lot of the diversity of the ships. 14) Jim did four or five beholder ships, and we liked all of them, so we married that idea to the fact that a lot of artists have done different takes on the beholder over the years. So the beholders became genetic racists, each clan of which believing they were the “real” beholders. 15) The best ship was the Nautiloid, which pretty much cemented the mind flayer in the setting, which makes sense since a ray-gun wielding illithid was in Expedition to the Barrier Peaks way back when. The mind flayers were so identified with Spelljammer that later, when we wanted to do them for Ravenloft, marketing pushed back, worried that we would take something cool from Spelljammer. We had to show that mind flayers predated Spelljammer. 16) The infamous giant space hamster also came out of ship designs. The gnome ship looked like a galleon and a sidewheeler slammed into each other. Someone asked what the big paddlewheel housings were for, since there was no air other than in the air bubbles. I said they were giant hamster wheels. Roger Moore (editor of DRAGON) thought that was hilarious and it was off to the races with the giant space hamster. So I’m not taking the fall for that one by myself. 17) The giff, however - hippo-headed humanoids with a penchant for explosives, are my fault. They join the thanoi of Dragonlance and the yak-men of Al- Qadim in that animal-headed humanoid department of things I have done. 18) The neogi came about because, if mind flayers were slowing getting more background and depth (and in doing so, becoming a bit more domesticated), I needed a new really bad-guy race. And a marriage of the moray eels and spiders was great. Plus the fact they kept umber hulks (another criminally underused race) as slaves. In the original the Neogi were much more fragile than their slaves. I think 4E did a good job with them. 19) The clockwork horrors were daleks in different skins. Oh, and with different colors. You realized that, right? 20) Unlike the Realms or Tekumel or Greyhawk, Spelljammer did not have a previous life before being incarnated as a game. I think this had an effect that we didn’t have a heritage to lean back on, to point at and say “this is how we did it.” So we had some strange structures grow up as numerous other creatives got involved. I would have named the Scro something else, for example. And I wouldn’t have put battleship guns on the bottom of the Rock of Bral (whose origins are the ROCK of GiBRALtar – again, I will take the blame for that one). 21) But my big regret is that I didn’t salvage the nautiloid model we had made for demos for the game. When we retired the line I tried to get hold of it, but was told it was going to be used to try and sell in a theme park ride. And then that during the presentation, someone had dropped it, smashing it into pieces. And then because it was broken, they threw it away. Sigh. 22) I’m happy with both how the product ended and up, with my contribution to it, though I was deeply engaged only in the original set and the Legend of the Spelljammer, and overseeing the first year of product before moving on to new challenges. Years later, Andy Collins revived the concepts, shed some of the sillier stuff, and put out Spelljammer: Secret of the Spider Moon. I thought that was pretty good as well. 23) And the whole thing about stretching the boundaries of D&D? It turns out that, after doing so, people STILL considered D&D to be “generic fantasy”, but now “D&D in Space” (Innnnn Spppaaaaaace!) was considered generic. Typical, vanilla fantasy. So what I learned was that D&D so dominated the market that ANYTHING we did was considered part of the background static. Not that this would keep me from doing it again. The Brothers Size by Tarell Alvin McCraney, Directed by Juliette Carrillo, Seattle Repertory Theatre, through 27 February. Well, this is disappointing. Not because this isn't a good play - it's an excellent play, a fantastic play. I am just disappointed that we were supposed to see this two weeks back, but the Lovely Bride had a horrible, horrible head cold, so we moved it to a week ago, and at that point I had a horrible, horrible head cold, so we moved it to this Saturday afternoon right before the darn things closes (If I got paid for these I would be very disappointed in myself indeed). Which is a pity, because this is play worth seeing, the most recent addition to an extremely strong season from the Rep. It is a well-written, well-directed, well-acted play, about the difference between brothers of flesh and blood and brothers of situation. Oshoosi (Warner Miller) is young and just out of prison, living with elder brother Ogun (Yaegal T. Welch) who is a mechanic with his own garage. Oshoosi is also friends with Elegba (Eddie R. Brown III), who he befriended in the joint. Part of the play is about how Oshoosi is pulled in different directions by hard, responsible Ogun and flightier, enthusiasitc Elegba. Part of it how Ogun has to deal with his responsibilities of his younger brother. And part of it is about how Elegba is trying to live up to Ogun's status as role model and falling short. In brief, then, it is a great play where the character move and rub up against each other and spark and grow. It also has different language and different levels. Part of it is the hard-voiced language of the Black American street, but also it has a mythic quality in the story as well. The names are those of Yorubu deities - Ogun at his forge, Elegba the trickster, and Oshoosi as the questing hunter. The Vodoun tradition identifies them as Ogoun, Legba, and Oxossi. Now add to that poetry of the language and the body as dance infects the actors as they are being ridden by their orisha namesakes. Now add another point, where the actor as storyteller comes into the fold, and the characters narrate their own stage action ("Ogun goes back under the car"). It feels like it should be pretentious, a writerly trick, but it really works here, both underscoring the characters as well a elevating the language into the realm where the characters see themselves as mythic. It ends up as a passionate play that moves the theater goer. It is also part of a genre I have written about before - the African-American-Male-Experience, which concentrates on the tethers of family versus the outer world. I saw it in Blue Door and in Top Dog/Under Dog. But this one gets it right and transcends its own feeling of genre (and interestingly enough, the previous examples were four and eight years ago). It grapples with the idea that you are in "theater-land", and timespace of the "Distant Present" and declares victory over it. The production takes place on a bare stage dominated by a concrete raft stacked with tires that are chairs, beds, women, dreamspace, luggage, and all other morphible objects. It helps create the timeless nature of the mythos that it occupies. And the actors themselves pivot physically, emotionally and mentally, dancers both in language and expression, switching from addressing the audience with stage directions to wrapping themselves fully in the reality of the play. Messers. Miller, Welch, and Brown all are brilliant, but it is Welch's Ogun that provides the ultimate center for the play. This is a play worth seeing, and my only regret is that I did not get a chance to see it earlier. It is a recent play, and McCraney a new voice worth hearing. Wish I could have told you about it sooner. Borders Books has declared Chapter 11 bankruptcy. It is closing about a third of its stores in an attempt to right itself, and a lot of people are viewing it as an end of an era, where the big box stores have been sunk by the rising power of online stores like Amazon, and the digital future chorused by kindles, ibooks, and nooks. And not a few give an ironic look at how these large chains sounded the deathknells for small indy bookstores, which apparently rampaged across the landscape like so many buffalo. I don't quite remember it that way. I grew up in a bedroom suburb of Pittsburgh, and didn't have access to much in the way of a "real" independent bookstore. I had the spinner rack at the drugstores, the book department at Kaufmann's (yeah, once upon a time, department stores had book departments), and the local and school libraries. That was my ground level. Book stores were elsewhere - in the city, in other neighborhoods, and near universities. (And as an aside, those looking for the secrets of the creation of D&D could get a leg up by knowing what volumes were available in the Lake Geneva Public Library back in the seventies - the situation there was similar to the Mt. Lebanon of my boyhood, but I digress). Anyway, large enclosed malls showed up in our neck of the wood (nearby Upper St. Clair/Bethel Park) in the midsixties, and with the the chain bookstore. Waldenbooks first, then B. Dalton's. These became the vector for books as I got older and more mobile.They didn't drive any local stores out - we didn't have a lot of indies to take away in the first place. Later these were in turn superseded by Borders, which was the anchor store of the nearby Norman Centre II, at the top of the next hill over, practically on Mt. Lebanon's borders. That first Borders was an amazing bookstore for its time. Two levels (!) with huge sections, wide selection, deep chairs, a fireplace, an elevator. Yeah, it sounds like standard equipment nowadays, but for the age it was pretty amazing. A magazine section that you would normally have to be in downtown Pittsburgh to see. As an author, I did readings there, and it was a regular stop in later years for taking my nieces for birthday books. Of course, such infrequent visits were not enough to keep it going. The store at the top of the hill is on the list of stores that are going to close. When I was last there, it was like visiting an old friend wasting away from a debilitating disease. The shelves were moved further apart. The selection was diminished. A lot of volumes, previous set on groaning shelves, were now face-out to take up more apparent space. And the SF/Fantasy section was no longer a haven of new volumes, but rather overwhelmed with omnibus editions (like collections that hold my Warcraft and Starcraft books) for mass sales. Later I would find the Barnes & Nobles in other cities, as well as other Borders - huge big boxes that made themselves destinations as opposed to someplace to visit when you were at Sears and Woolworth's. And these big boxes took their own toll on the Waldens and Daltons, though they were part of the same families as their gigantic cousins. So yeah, the chains got to places that indies would miss. The chains also had an effect on gaming. TSR fought hard through the years to get a piece of the bookstore trade, aided by strong efforts by the merchandising division of Random House, which was seeking to expand out the presence of more than just books in the bookstores. One the reasons TSR did more hardbacks as the years went by as opposed to shrinkwrapped boxes was input from the bookstores - the problem was shrinkage, which translated into people breaking to boxes and looting the dice. Hardbacks showed less wear and tear, so they were the way to go. With the success of paperback gaming-world fiction like Dragonlance and the Forgotten Realms series, we had carved out a chunk of the store as our domain. You go into a big box and it has a gaming ghetto on the shelves with WotC, Pathfinder, and other hardbacks, you're seeing the results of those early efforts. The big chains did a job, carrying games into a new world. It was not always the smoothest or most impressive presentation (hence the gaming ghetto title), but it created a stable platform of sales over the years (good for the companies) and created a literate gaming-savvy repeat business (good for the stores). And now Borders is no more. Whatever survives in its place will be charming and archaic, like those old live theaters that have been retrofitted for movies, the balcony sealed off and the mighty Wurlitzer silent. Independents will survive, even thrive in the post-asteroid landscape now that one of the big saurian families have been knocked back. Indeed, those survivors who understand books may re-establish themselves in the very same ecological niches. Maybe even in the empty space at Norman Centre II. I know that some are quick to dump the moist earth on Borders' coffin and inter it, and its list of faults and flaws are many. But I also know the effect that these big chains had both on the development of my own reading habits and the growth of gaming, should not be forgotten. For many years I lived in Wisconsin, which has always been a politically diverse state. It has strong urban centers and old big-shoulder industry, farming and granger movements, universities and a proud heritage of progressive politics. Historically, the state politicos have ranged from Bill Proxmire to Russ Feingold. As a result, it can move politically from the very progressive to the very conservative according to the whims of its voting mass. And at the moment, it is in the hands of its conservative faction, and paying the price for it. Its new governor, Republican Scott Walker, has already made waves by turning down funding (and jobs) for pointy-headed intellectual stuff like high speed rail and rural Internet (which gives more for the other states, so - Thanks Governor). And it should be no surprise that he wants to engage in the time-honored sport of union-busting, particularly with the state workers. So the governor wants to deny collective bargaining to the state unions (we're talking public service, teachers, prison guards, but not police and firemen (he specifically did not hit them in hopes of their support)), and have the right fire employees engaged in labor actions. Again, not out of the ordinary for this stripe of politico. Thing is, he's not doing it in a legislation, but rather as part of his emergency budget, hoping to slide it in without any type of opposition. OK, that's a little snakier than normal. Oh, and when announcing it, he said he has already contacted the National Guard in case the people get all uppity about all this. Hang on. He did what? The Governor's office clarified that he did not call OUT the National Guard. He just briefed them on the possibility that as a result of his imperial, unilateral action, people might take umbrage and they should be aware. I think that this is the one bit that went too far, that spun everyone around from "Oh, this is politics as usual" to "Hey, this guy is crazy". Despite having a governor funded heavily by the US Chamber of Commerce (hence the union-busting), the population has a strong history of union support. Why do I bring it up? Just to get the word out. Most of what I know about this is coming through Facebook and email, from fellow Alliterates who live in the area, and individuals like comic artist John Kovalic (who does the strip Dork Tower). The teachers are turning out tomorrow, and the firefighters are showing up (so much for splitting up the unions). I'm getting some bits from the lefty analysis from the Stranger Blog. But for the most part, the media is pretty durn quiet (The Seattle Times covered the initial statement from the governor on Page A8, burying the lede in paragraph four). Not a lot of news teams seem to be bound for Madison, Wisconsin. Maybe they're caught up dispatching teams to Egypt, trying to catch up with THOSE protesters. [Final Update (and I mean it)]: Page one, Seattle Times, below the fold. Rightwing pundits refer to protesters as rioters. Local police chief, who is used to students burning sofas after a big game, thanks the protesters for their well-mannered behavior so far. OK, it happened a couple weeks back, but there was this stuff in Egypt and the Super Bowl and things got busy at work. Truth of the matter is, it has only been three months and change since we hit 11000, so the rate of recovery (for those that invest in stocks, at least) seem to be increasing at a rate that would put the go-go Clinton years to shame. It seems to be rising as faster than when it was falling previously. Yet despite this, we seem to be spending an inordinate amount of time fretting about the idea that, if we don't give the corporations another cookie, they are going to shut everything down and put us into another deprecession (yep, its a new word. Coined right here. You can send me a nickle whenever you use it). Part of it may be because chunks of the economy are still crashing down around us. Part of it may because our local paper of record both thunders about cost-cutting and then bemoaning the pain of that cost-cutting. And part of it may be that, looking at the gap between Wall Street and Main Street, more and more of us seem to be on the Main Street side, watching the engines of industry pulling away. And it may just be that stock prices, like gas prices, have no connection to real world anymore (gas is just past 3.33 around here - did we start another war and no one told me?). On the stock market, it is not small investors or even master-level money-crafters, but robotic AIs that spin according to their own algorithms, ignoring the meatspace that surrounds it. I dunno. Maybe I just need a new way to keep score. Maybe at 13000. I'm sharing this with the audience beyond Facebook. Editor extraordinaire Jim Lowder posted a note on his page that two books I have contributed to: Family Games: The 100 Best and Hobby Games: The 100 Best are both going to be used as textbooks at DigiPen a local college which teaches video game design (and among whose alumni include a number of fellow ArenaNet employees). I am delighted by my increased standing in academia, and realize that I am one step closer to becoming the "Official Gaming Pundit" on the Daily Show. 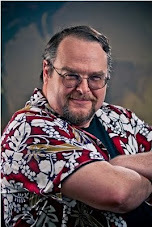 I've also been reminded the Steven Schend that today is Jeff Grubb Day. So be sure to load up on all the necessities for your Jeff Grubb Day celebrations. Oh, and the Roger Moore story mentioned is here. Oddly enough, as I've moved around the country, I've tended to pick and discard my loyalties for baseball teams but accumulate my loyalties for football clubs. I grew up in Pittsburgh during the time when they were horrible (The big play of the game as deciding which way they would run off the field at the end of the game) and when they were mighty (Franco Harris, Terry Bradshaw, the Immaculate Reception, Myron Cope and the Terrible Towel, etc...). And I lived in Southeastern Wisconsin in a town that literally straddled the line between Bear and Packer territory. And now I live in Seattle. So I can usually count on one of "my" teams getting to the playoffs, and have a good track record of going all the way. In this case, two teams that I root for made it all the way to the Superbowl. Packers and Steelers. The Packers are a wild-card team that outperformed in the playoffs. The Steelers are continuing their Dynasty with a third Super Bowl under the same QB. And once again I am looking at the narrative behind the game. I've been here before in rooting for multiple teams and seeing the narrative evolve behind them - Steelers versus Seahawks in Detroit. The narrative at that time swung towards the Steelers - It was rusher Jerome Bettis's last game, in his home town. The Steelers were representing a town of old industry against a town of new tech. Pittsburgh had Primanti Brother Sandwiches, Seattle had Starbucks. Pittsburgh was steelworkers (ignore the diminishing number of mills in the 'burgh), while Seattle was tech support (that is to say, wimps). A national poll showed the Steelers overwhelmingly favored both on the field and in the hearts of America. And this narrative had an effect - the Steelers got a close call that, years later, the ref said should have gone the other way (hey, thanks guys). The influence of who SHOULD win the game affects the play of the game itself. This year, the cleated shoe is on the other foot for the Steelers. Far from the favorites, they operate under a cloud. The QB Rothlisberger was suspended for sexual misconduct early in the season, and much of the Pittsburgh narrative has been about how this is the redemption tour. Most folk have already made up their minds, and he and the black and gold have been fitted with the black hat. The attention (and the fan jerseys) have shifted over to number 86, Hines Ward. The Packers, for their part, are the scrappy underdogs this time, ignoring their own great heritage. Their QB is there for the first time, and they have their future ahead of them. The end result? The Steelers should be heavy favorites but there is only a spread of a couple points, and national opinion polls give the game to the Packers. Will this spill out on the field in the officiating? Into the broadcast booth in the calling of the game? Seahawk fans know about this type of pain. Then there is the political aspect. The President was a big supporter of the Steelers two years previously, and owner Dan Rooney was made Ambassador to Ireland. The game is on Fox with a big celebration of Ronald Reagan's 100th Birthday (come on, guys, the Republicans need their own FDR/Kennedy legend, even if they have to build it themselves). So, ignoring that Wisconsin has been a "blue" state, is there a political polarization to the game? And finally, for those who are going to watch for the commercials, here is what I am predicting - Dead Celebrities, Animal Attacks, and teaser commercials that tell you to go to a website for a punchline. Because nothing claims the dominance of a media like ads that send you to a completely different media. Am I calling the game one way or another? I'm no fool. I have good friends on both sides of line this time. I'm just going to enjoy it, knowing that by the end of the day, one of "my" teams is going to win. And that works out well for me.